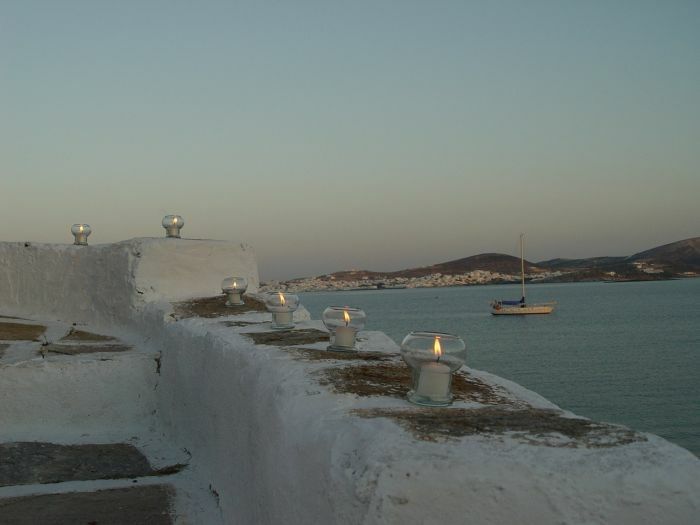 " Villa Galini " , is a small , quite and very clean Hostel in Naoussa / Paros in Cyclades / Greece , an excellent starting point for visits to the sights of Paros . has 10 double's and triple's rooms, all ensuite , a simple construction with bathroom, fridge, telefon (dir. dial ) AIR FAN , and on request many others facilities . PLEASE NOTICE , YOU PAY ONLY CASH , BY CHECK IN , NOT AFTER . We are 250 m . from the Beach Piperi of Naoussa, 600 m . from the Center of Naoussa. Very near from the Bus- Station : When you are coming with the bus to Naoussa, you can go out from bus in bus-station " Police ". Or from the NEW BUS - STATION , follow after that the Boards " VILLA GALINI ". We have NOTHING WITH HOTEL GALINI to do . PLEASE NOTICE , YOU PAY ONLY CASH , BY CHECK IN , NOT AFTER . The rooms have priv. Bathrooms , WC , Shower, telefon, fridge , air fan , Veranda or Balkony or a nice place with table and chairs in our lovely Garden , and on request TV, Radio, Hairdr., cutleries , and many DVD's with nice films or CD's with greek and international music. PLEASE NOTICE , YOU PAY ONLY CASH , BY CHECK IN , NOT AFTER . Please , FOLLOW these INSTRUCTIONS ! ! ! Simple , but very clean rooms ! . Change from Towels every day and Sheets every two days ! ! ! . We have a simple House but our plus point is the nice relation with our guests and the cleaness in the House . Also the very good service every day . We try our best , for our Guests . Try us ! ! ! We try to give the right information for every question from our guests : GENERAL INFORMATIONS FOR NAOUSSA & PAROS : We give you some of the many beaches in the island:Kolymvithres , Waterpark, Monastiri , Laggeri , Santa Maria , Molos , Pounta , Chryssi Akti , Faragas , Agia Irini , Parasporos , Marcello, Krios . Some of the monuments in the island : Panagia Ekatontapyliani , archaiological museum , Laografical museum of Naoussa, Venecian castle of Naoussa . Some of the sights of Paros : Petaloudes, Dilion , Asklhpieion , archaiological cemetery of Parikia , Cave of Archilichos . We are always near to our guests , with informations , with good tips, with service by the reception for travelling , tickets , or small tours in the Island Paros or other Islands . We organise tours for Delos , Mykonos , Hrakleia , Koufonhsia , SANTORINI . Backpacker facilities Balconies Clock radio Coffee/tea maker Cribs available Ensuite Fax service Hairdryer Internet access Iron/ironing board Keyless entry Maid service daily Mini-bar Mountain view rooms Movie rental Non-smoking rooms Please ask us about things which you need . If we can Private bathroom Refrigerator Rollaway beds available Showers without bath Smoking rooms Telephone Television Television (cable/satellite) VCR/DVD Video games Voltage converters WIFI Wake-up calls or have we are giving to you free charge . Very quite area and near of the Beach ( 200 meters ) and the Center (600 meters) of our cosmopolitan Village : Naoussa. Near are backery, bus - station , super markets, mini market , book shop , petrol station , restaurants and the center of the village of Naoussa . Naoussa , near Bus station . Lefkes , nice view . Please, ask always us , about prices and special OFFERS !!!!! Ask us , about our special discounts for groups !!!!!!!!!!!!! PLEASE PREPAIR your CASH- Payment >> >> >>>> it is ONLY CASH , in Y O U R A R R I V A L , with your CHECK IN .Please , follow that rule, for your Payment. a) Cancel. : less as 10 days before your arrival , you pay 7 (seven ) days,if your reservations are more then 7 days . b) Cancel. : more as 10 days before your arrival , you pay nothing ! ! ! . c) Cancel. : By seven ( 7 ) days and less , you pay all your reservation . Near of Bus Station " Police " of Naoussa. Follow after that the Boards : VILLA GALINI " , or by the NEW BUS - STATION , in Naoussa . When you are out from the bus , you follow the road straight and parallel with the bus and the first vertical street or second road by right hand , ( after 200 meters , on the small hill , right , about 70 meters . a)With the Bus or Taxi . b)The Bus station in Parikia is the " next door" by the port , and the NEW BUS STATION in Naoussa , is only 2-3 min. from us . c)The taxi's drivers bring you direct in a little minutes to our place : " Villa Galini " . Tell them TO VILLA GALINI , not something else . We have with : others "l Galini " , nothing to do .